Last Sunday I took the Antron 99 down from the house after it had snapped in December. I didn't have anything very good to replace it with quickly so I put a 28MHz mobile antenna on a bracket in its place. 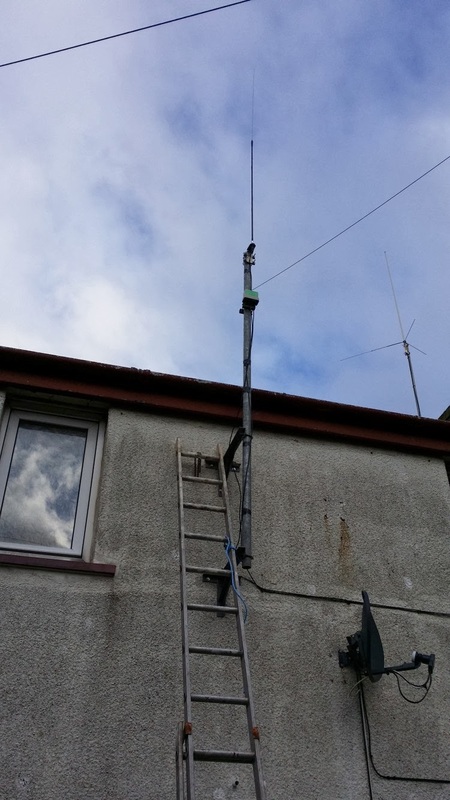 It doesn't really work as there aren't any radials (the metal pole its on might help a bit) and the SWR is around 3:1 on everything above 18MHz. I did a few checks on performance by transmitting from the car on 28MHz and remotely viewing the Flex1500's signal readings on my phone using TeamViewer. I'd taken some readings last year on the Antron 99 and the new antenna worked out as around 9dB worse over a 1km path. That was without any tuner in line at home, it probably wouldn't have made much difference to the signal anyway. I'm using it on 20,17,15,12 and 10m bands with a tuner and on receive for all other bands. At lower frequencies I think it it works better on receive than the wire as it is further away from the phone wire. I've been using the 160m band quite a bit in the last few months (using WSPR), as I found my wire antenna will tune up on there since I extended it in the summer. The noise level at home is such that I still transmit better than I receive, even on a wire which is far too short. I wonder if the phone wiring re-radiates the signal.